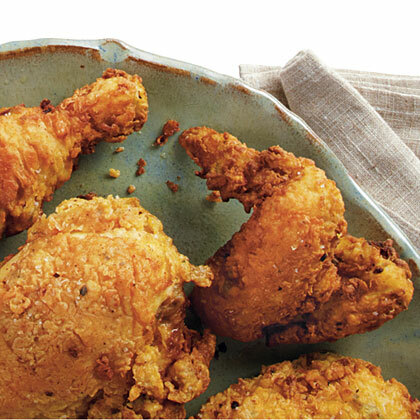 Search results for "fried chicken"
Enjoy fried chicken without the guilt with this oven-fried chicken recipe. 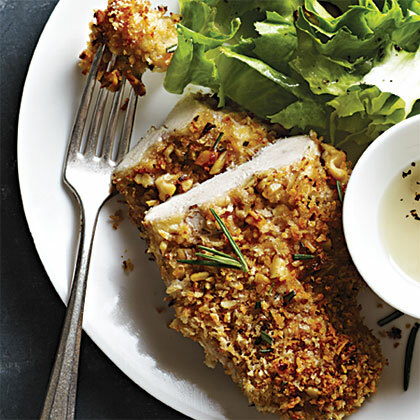 Marinating in buttermilk results in tender, juicy chicken, and double breading gives a crisp crust. Pan-fried chicken is a healthy alternative to traditional fried chicken. Replacing some of the salt with spices like ginger, paprika, cinnamon, and nutmeg reduces the amount of sodium and pumps up the flavor. 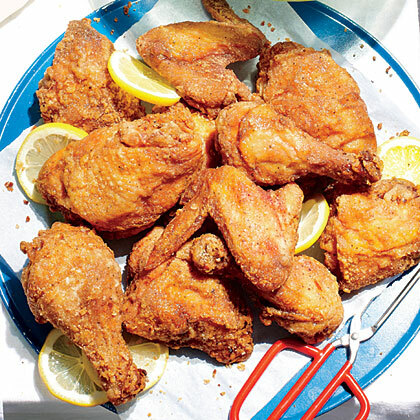 "I always brine chicken, because it seasons it all the way through," says Julia Lee, aka the Fry Queen and a cooking teacher in San Francisco. She likes her chicken seasoned very well; if you prefer it less salty, go for the shorter brining time and smaller amount of salt. 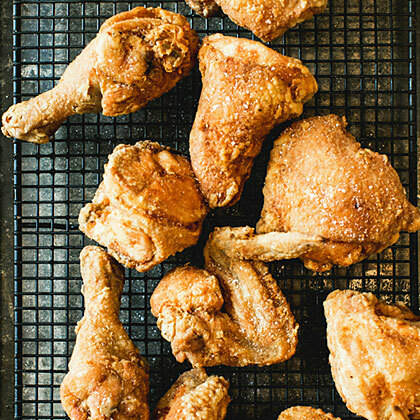 Nothing says "Welcome Home" better than a big platter of fried chicken. Instead of picking up a bucket, save a little money and make it yourself. 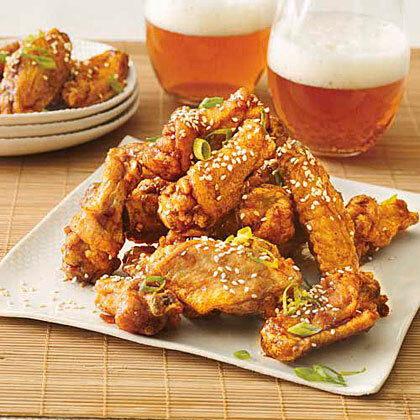 "Garnished with sesame seeds and scallions, these look (and taste!) just like my favorite restaurant wings." --Cindy Fan, 36, Alhambra, Calif.
Use this creamy sauce to dress up store-bought fried chicken or as a salad dressing or dip for wings. Adjust the heat by adding more or less jalapeño. 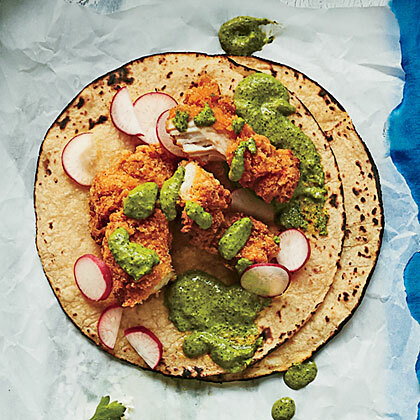 We like to double up on the tortillas, taco-truck style, for any of these tacos. 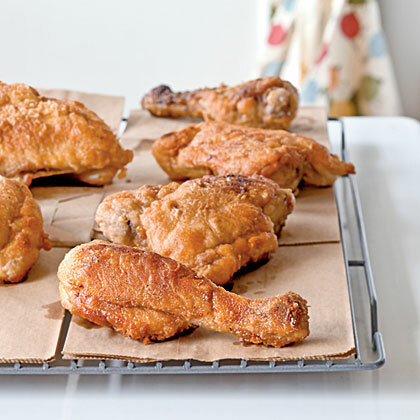 For incredibly indulgent fried chicken, wrap the uncooked chicken breasts in bacon and fry in hot oil until golden brown. Serve with white barbecue sauce. 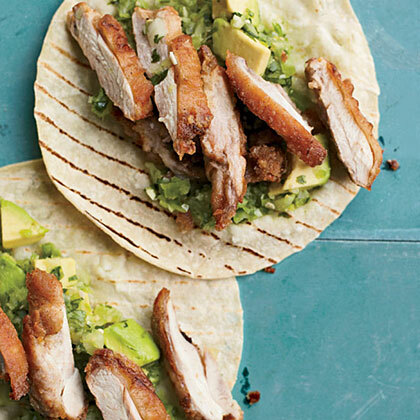 This simple recipe is a revelation: It tastes as good as the old-school, supersavory chicken you'd get in a bucket. 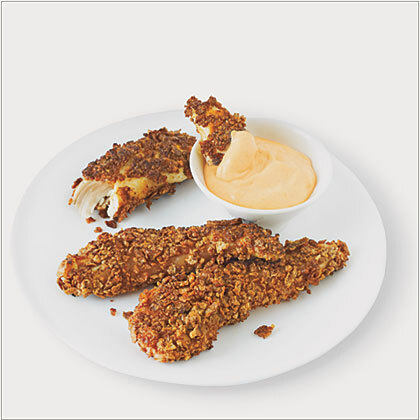 These lightened-up chicken fingers are dredged in a crunchy cereal coating, lightly pan-fried, and served with a spicy homemade mayo that's perfect for dipping. The crust gets golden and crisp in the skillet and helps insulate the chicken to keep it supremely juicy. In The Help, the character Minny reveres Crisco, calling it "the most important invention in the kitchen since jarred mayonnaise." 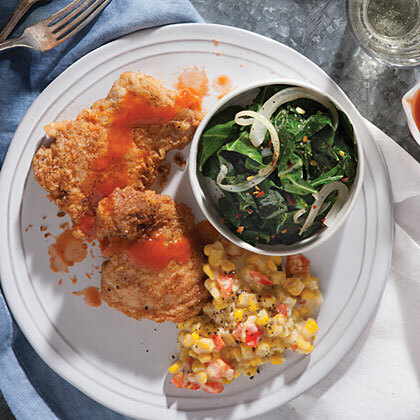 She uses Crisco to fry chicken to perfection, admiring the way the vegetable shortening "bubbles up like a song" as it cooks. 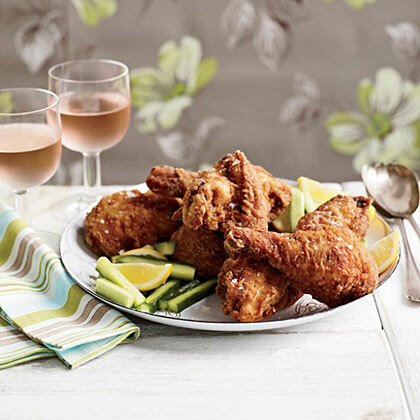 A marriage of Southern favorites: Our salty-sweet brine of brown sugar and freshly brewed tea infuses this picnic-perfect chicken with juicy flavor before frying. Bonus: The tannins in tea act as a natural tenderizer. 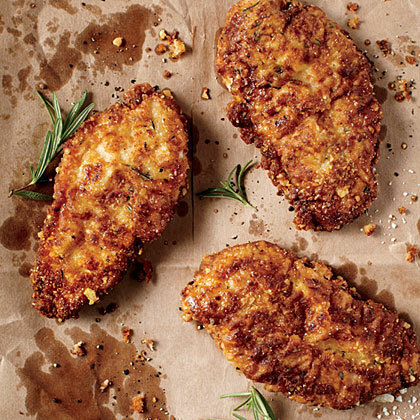 Make this delicious, oven-fried chicken recipe using chicken cutlets to get crispy, non-greasy fried chicken. While the chicken marinates, prepare the sauce and chop the vegetables. The rest of this stir-fried chicken dish goes together in minutes. 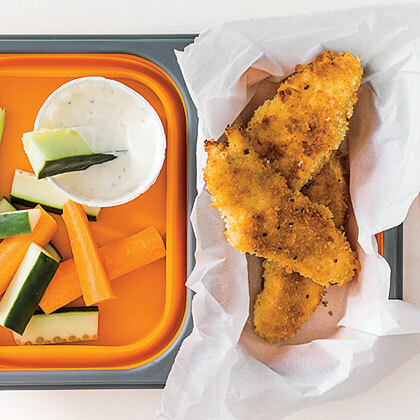 The panko breading holds up and stays crisp when these chicken fingers are made ahead.